Take in the stunning view as you dine on the sun deck. Gather around the fire pit and roast marshmallows. Experience the Smoky Mountains in comfort. Loaded with extras, you won't want to leave. Perched on a mountainside, Smoky Mountain High is conveniently located to many area adventures. 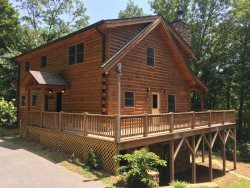 This spacious, upscale cabin has all the comforts of home plus a hot tub, pool table, and fire pit. 4 Bedrooms & 4.5 Baths: 3 King Beds, 2 Twin over Full Bunk Beds. The first bedroom has a king bed and TV. It also has an en suite bathroom with custom tile, a dual sink, bath tub, and a shower stall. The second bedroom on the main floor also has a king bed and a private bath with a tub and shower combination. The third bedroom is downstairs and has a king bed. There is a bathroom across the hall with a tub and shower combination. The fourth bedroom has two Twin over Full Bunk Beds. The fourth bedroom also has an en suite full bathroom with a tub and shower combination. Granite countertops glisten in the kitchen. With an island and prep sink, there's plenty of room to cook up your favorite dishes. Lounge on the sun deck or grill as you take in the soaring mountain view. Rain or shine, relax in the bubbling hot tub on the covered porch. Circle around the fire pit and try to spot the Great Dipper in the pitch dark night sky above. What better way to end the day then with a game of pool? Turn on the TV in the downstairs game room and kick back around the pub table as you await your turn. Take the plunge! Rafting on the invigorating Nantahala River is just 20 minutes from the cabin. The Great Smoky Mountains Railroad with themed rides like the Polar Express is only a 20 minute drive. Downtown Bryson City with restaurants, shopping, and the Fly Fishing Museum of the Southern Appalachians is also a 20 minute drive. Delightful restaurants like Ruth's Chris Steakhouse and Brio Tuscan Grille are 25 minutes away at Harrah's Cherokee Casino. Waterfall hikes at Deep Creek in the Great Smoky Mountains National Park is about 20 minutes from the cabin as well. For Smoky Mtn High Reviews, please click on the Reviews Tab. Maximum capacity of up to 12 is based on county guidelines. Smoky Mountain High has an non-refundable Additional Guest Charge for the 7th through 12th guests of $15 per person per night. For all of our cabins with parties of 8 guests or more we require a Large Party Security Deposit of $400.00. We had a great family reunion trip! Amazing weather for this time of the year. Rained just enough for us to enjoy some relaxed days in the hot tub and had some beautiful days for hiking and views! We enjoyed the Aquarium in Gatlinburg, Biltmore Estate in Asheville and Cades Cove. A great trip all around. We are convinced we got the best cabin up here. Everyone in the staff was great, communication was easily and everyone was very helpful. We enjoyed a wonderful trip to this cabin for Christmas holiday. We had fun at the Biltmore, shopping, eating in Bryson City. Sightseeing and shopping for antiques. Thanks for the beautiful views. All questions answered quickly and knowledgeable. Everything on the web worked well and responses were timely. First Time in Bryson City but it was amazing! The pictures didn't do the cabin justice. It was beautiful, amazing and breathtaking. Every inch is well worth it. We will return and this cabin will be my first choice. This cabin is so beautiful and roomy. THe top deck was our favorite. The weather in the mountains is ever changing and so awesome to watch! Always helpful when I called! Everything was exceptional from beginning to end. Very nice and helpful, they called me at the cabin to make sure we arrived safely and told me to have a wonderful weekend. The call made me feel very welcome. Thank you so much for this beautiful weekend in such an incredible place. The view changes with the light and is magical. A wonderful experience for everyone. We will be back next year. They were friendly and helpful with suggestions for activities, restaurants, and stores in the area. We came together to celebrate a Wedding. We came from far and wide and had a great time. Extremely knowledgeable and friendly, it was important to them that we enjoyed our experience.